Opah are top predators found worldwide. Between 1987 and 2001, 6,569 opahs were recorded as being caught by longliners in the Western and Central Pacific Ocean. 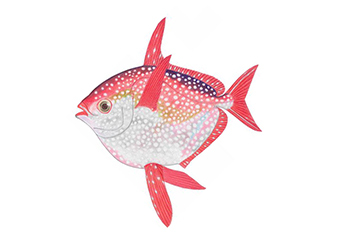 In the WCPO, opah are managed by the Western and Central Pacific Fisheries Commission (WCPFC). No management measures exist for opah in the WCPO, north or south Pacific and management of bycatch is lacking. Opah have life history characteristics that make them moderately vulnerable to fishing pressure. The status of opah in the Western Central Pacific Ocean (WCPO) is unknown and there is no information on the fishing mortality rates. Pelagic longlines are a nonspecific fishing method. Extensive bycatch of tunas, sharks, sea turtles and seabirds occurs. The non-target species caught include several of near-threatened or endangered status as designated by the International Union for Conservation of Nature (IUCN). The species of concern include loggerhead, hawksbill and leatherback turtles. The opah fishery puts significant pressure on these threatened species. Management is insufficient to protect the bycatch species. Pelagic longlines have minimal impacts on the habitat as they rarely make contact with the seafloor. The ecosystem impacts of removing exceptional species through fishing have not been explored, and are not incorporated into management schemes.